There is great interest in replacing fossil fuel resources with renewable raw materials. Widely distributed lignocellulosic biomass is viewed as a potential candidate to address energy and environmental demands. 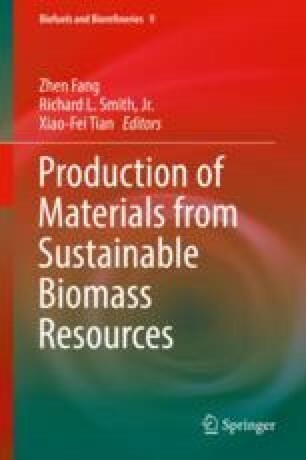 In this chapter, the use of the hemicellulose component of lignocellulosic biomass, xylan, is considered. Due to the presence of ester and ether lignin-carbohydrate linkages, extraction of xylan is generally restricted to cell wall matrices of wood and lignified grass. Many extraction methods of xylan have been proposed, however, the subsequent purification and analyses are needed on its fine structure. An effective way to modify xylan with advanced properties is through etherification. This chapter points out new functionalities, for example, thermoplasticity, hydrophobicity, conductivity, and stimuli-responsiveness of xylan by chemical modification and it summarize recent reports on xylan, including extraction, purification, chemical components, structural features, and functional properties. Xylan derivatives, xylan-based materials, and their potential applications are discussed and future research areas are highlighted. This work was supported by the Fundamental Research Funds for Central Universities (JC2015-03), Beijing Municipal Natural Science Foundation (6182031), Author of National Excellent Doctoral Dissertations of China (201458), and the National Program for Support of Top-notch Young Professionals.